Here is the short write up written by Mr. Jake Tadla of DDLC about the Pawsion Event that took place in SM Lanang Davao City. We Filipinos, being traditional and family-oriented as we are, save up Sundays to spend quality time with our dear ones. Last 14th of September 2014 was no different. However, it was a significant day laid out for our furry loved ones and their human parents to dress up and impress the eager crowd by gracing the catwalk. The Davao Dog Lovers Community (DDLC), in cooperation with Mini Air Dog Cafè, Philippine Siberian Husky Club Inc. Davao Pack, Red ROCK Designs and Prints, with the outstanding help of Pongee Party Shop, The Mindanao Daily Mirror, Davao Kendo Club, Baby Moon Pawprints, and Jade's Cargo, and through the accommodating grounds of SM Lanang Premier, we were able to showcase the unconditional and exemplary friendship of man and dog through a one of a kind fashion show and theme-based photo contest. Twenty-seven (27) human-dog teams proudly participated in the fashion show and sixteen (16) photographs were hung on the board at the SM Fountain Court for everyone to appreciate. 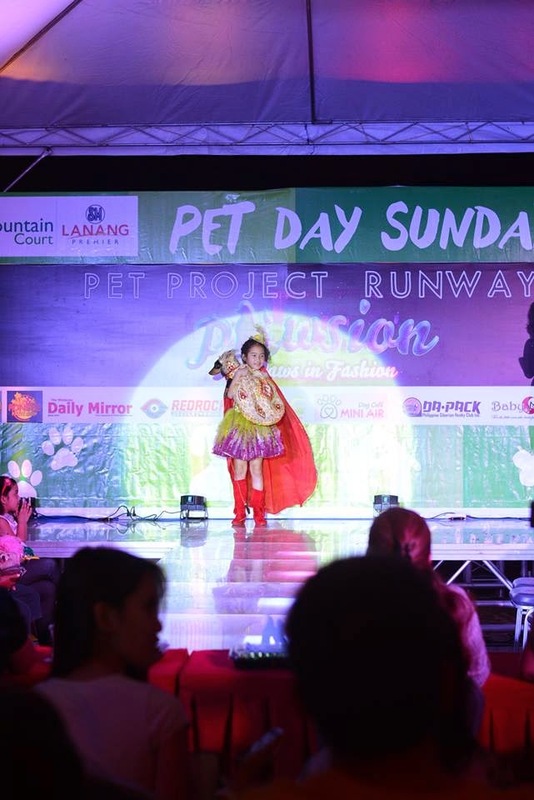 Aside from the Pawsion participants, event goers together with their furkids dressed up in accordance to the fun height of the show and were recognized during thw program as our audience pawsionistas. Chelo Femiz & Sparkle (1st - fashion show), Carlito Laurel & Missue (2nd - fashion show), Eugene Maning & Pewee (3rd -fashion show), Joy Raphanan & Dexter (1st - audience pawsionista), Gianne Tuazon & Wicca (2nd - audience pawsionista), and Alan Lee Lopez & Peanut (3rd - audience pawsionista) bagged the respective recognition at the end of the event. All fashion show and audience pawsionista winners received specially handcrafted hats from Baby Moon Pawprints. Through the in betweens of the programme, trivia winners also received dog fashion clothes from Paws Avenue. Everybody also witnessed and was awe-inspired by the dog wedding of Agong of Mini Air Dog Cafè and Dobbie (friend of the cafè owner) stated their vows and marked the start of their dog days as mates. Occasions like this envision to strengthen the unconditional bond between man and dog. This event was also a venue for the four-pawed creatures and their parents to socialize and share their stories with their fellow, as well as learn to make their relationship better through every joyous day, may it be warm or cold. Special and utmost gratitude to those who helped in making our furkids' fab up experience an absolute blast. That day is already a memory well-kept for the jovial disposal of the future. Photo credits: Davao Dog Lovers Community Facebook Page.